Summary: When Betts meets Aiden at the candy store where she works, their connection is like a sugar rush to the heart. Betts already knows the two of them are infinite. Inevitable. Destined to become an us. Betts has only ever kept one secret from her best friend, Jo, but suddenly there’s a long list of things she won’t tell her, things Jo wouldn’t understand. Because Jo doesn’t see how good Aiden is for Betts. She finds him needy. Possessive. Controlling. She’s wrong. 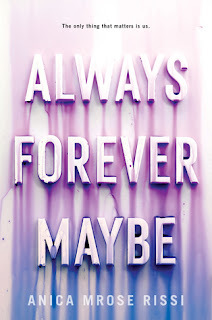 With a love like this, nothing else matters.. .
**My review of this book was originally published on TeenReads.com! This book caught my attention from the very first moment I read the summary --- a book about an intense romance is something that I'm super interested in. And I'm glad I decided to pick up this book, because I flew through it and couldn't put it down, because the situations in the story kept escalating, and I kept wanting to know what would happen next. As the summary explains, Bee/Betts meets Aidan when he stumbles into the candy shop she works at once day, and things quickly escalate from there. They flirt for awhile, and then before she knows it, a fast, intense, super-adorable romance starts to bloom --- but things get more chaotic with each passing day. Aidan starts to get more controlling and possessive. His moods run hot and cold. He hates Bee's friends. And he even does some terrible, horrible things that he can't take back. But Bee refuses to believe he's a terrible guy, because they're in love, and their life is supposed to be perfect together. To her, their love is the only thing that matters. But at what cost? I enjoyed reading this book. Like I said, this story gripped me right away and I found myself flying through it --- it's less than 250 pages long, which means it's the perfect summer for me because I get to breeze through it. There were so many things in this book that I enjoyed --- especially Bee's friendship with her best friend, Jo, which I will get to a little bit later. It was also really interesting (and shocking) to see how quickly Bee's relationship spiraled and how Aidan became bad news after being perfect and amazing in her eyes for so long. While I was reading the book, I kept coming across so many warning signals for an abusive relationship, and I wish I could've jumped into the story and pointed them out to Bee earlier on so she could've left Aidan when she had the chance, before everything spiraled out of control. But this book also managed to give me a deeper look at how victims of abuse process and justify the things that happen to them, in ways that I've never experienced and do not understand. So it was really eye-opening on that front. My favorite character in this story was definitely Jo. She was sassy and funny, and she was also super loyal to Bee, even when Bee wasn't being a really great friend to her. She reminded me a lot of my own best friends, who are always there for me, and the way she laughed and joked with Bee, had their inside jokes and special moments and even when she pushed back about Aidan were all reasons that I loved her so much. I wish she could've been my own best friend! However, one of the things that I wasn't totally sold on with this book was the insta-love factor. I've never been a huge fan of insta-love, so it bothered me a little bit that Bee immediately falls for Aidan and knows he's "the One" after a ten minute exchange in a candy shop. That's the only thing I wasn't super enthusiastic about in this story! 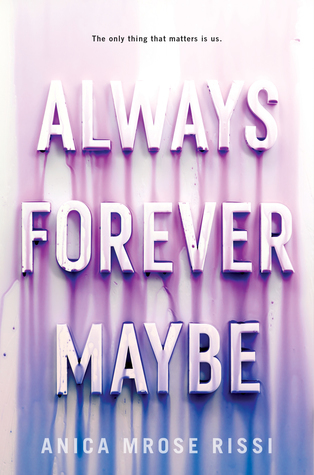 Overall, I enjoyed reading Always Never Maybe. I feel like it's an important story and a cautionary tale of how quickly and sneakily relationships can go wrong and how what was once a great love can quickly turn into a terrible situation. If you're looking for an intense and gripping, yet also brief and easy read, this is the book for you! I normally HATE insta-love, but I felt like it was justified in this book. Sometimes people really believe they are immediately and incredibly in love with someone. This is a dangerous way of feeling and thinking that unfortunately happens in the real life. I think it's very psychological.